Service more vehicles and make more money with the Versymmetric® and Versymmetric® Plus CL10series 2 post lifts. Its exclusive Versymmetric® Technology provides the versatility to safely lift cars, trucks, vans and SUV's symmetrically or asymmetrically within the same service bay, within rated capacity. Features conventional power controls, directSPOT offset 3-stage front & rear arms and single-point mechanical lock release. Service more vehicles and make more money with the Versymmetric® and Versymmetric® Plus CL10series 2 post lifts. Its exclusive Versymmetric® Technology provides the versatility to safely lift cars, trucks, vans and SUV's symmetrically or asymmetrically within the same service bay, within rated capacity. With three Versymmetric® 2 post lifts productivity configurations - Max Plus Productivity, Maximum Productivity and Complete Productivity, adjustable height and width options, and custom color options, CL10series two post car lifts are the best choice for professional service facilities. CL10series comes standard with offset 3-stage front arms allowing them to be stowed in an asymmetric lifting position, rear of the front tires. 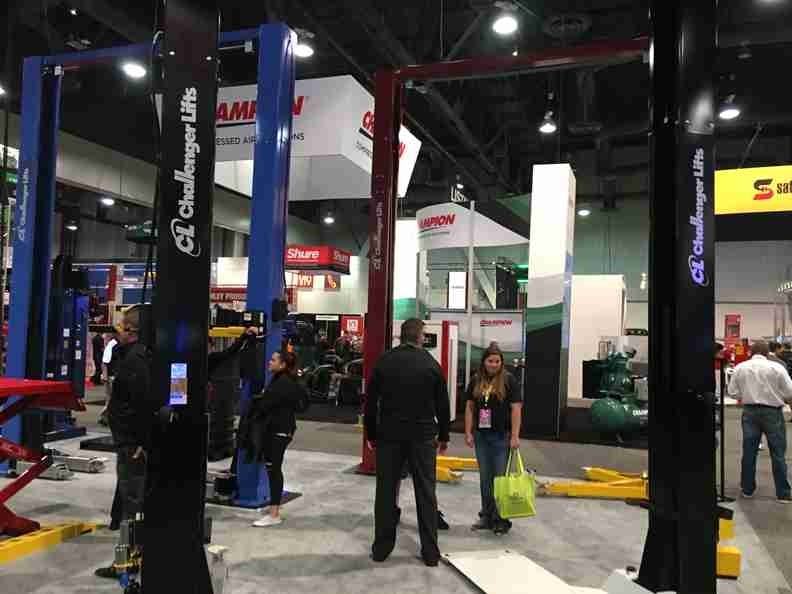 Unlike many competitor lifts, when the vehicle is driven through, the front arms are capable of directSPOT™ to the vehicle's lifting point without having to reposition the vehicle or shuffle back and forth to reach its recommended lift points. 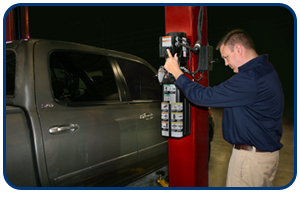 CL10series 2 post hydraulic auto lifts provide automotive service shops with the right equipment to service the most vehicles on the road in one single auto lift service bay. It's Versymmetric® two lifts in one design makes it both a car lift (asymmetric lifting) and a truck lift (symmetric lifting). What's this really mean? Shops do not get caught in a situation where they cannot safely and properly lift a certain vehicle that comes in for service. Offset front arm provides single sweep spotting - no rolling vehicles back and forth to swing front arm clear of front tire. Other standard features include double telescoping screw pads, Heavy-Duty pulley and cable equalization system, 48" elongated carriage, rubber door guards, adjustable arm restraint shafts, single point mechanical lock release and padded overhead shut off. Versymmetric® offset front arms provide directSPOT™ to vehicle lift points and safely lifts both symmetrically and asymmetrically within the same service bay maximizing service capabilities and revenue potential. Oversized 5" diameter pulley and heavy duty 5/16" cable reduces stress on 2 post lift equalization system and increases cable life. Fully gusseted base plate design reduces column deflection. So, you want the best? Of course you do! That's why you're looking at a challenger lift right now. You know Challenger. 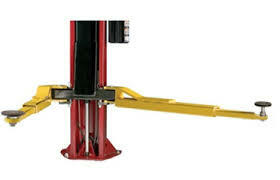 They've been around much longer than a strong majority of all those other inferior auto lift manufacturers out there. And it shows. Nobody makes them better. When it comes to their two post lifts, their CL10 Series lifts are the pride of the industry. They boast features that other competitors wish they could offer. Plus, many models are also made in the USA. Contact us for details. When these other manufacturers claim they're just as good as, or the same as a Challenger, don't believe them. There's a reason they have such a long term list of satisfied customers. The cylinders are premium grade and offer ultra-smooth functionality, and they won't start leaking a day after the warranty expires. They were the first manufacturer to offer three stage arms on their top two post lift models, and most models are ALI certified. Many two post models offer the innovative Versymmetric feature invented by Challenger back in 1992 that allows you to adjust the vehicle forward or rearward on the lift, to adjust the center of gravity closer to the columns. This gives you the best of both worlds, so you don't have to choose between symmetric or asymmetric. They are the true pioneers of the industry. Always leading, always innovating, and always providing smart solutions to satisfied auto shop owners. 11' 6-1/2" / 11' 11"
Min. 19-13/16" / Max. 42"
Min. 37-5/8" / Max. 60"
Min. 3-7/8" / Max. 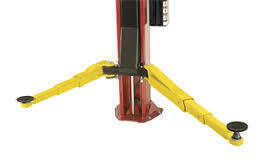 6-1/2"
Rise Height is measured with adjustable screw pads in highest position. Specifications are listed with lift at maximum width and/or height settings. Optional 3 phase electrical also available (Not available for Quick Cycle models). Specify at time of order. Standard lift colors are Red and Blue. Optional colors available. Versymmetric® auto lifts safely and properly accommodate cars, trucks, crossovers, SUV’s and vans all within the same service bay. Their 2 Lifts in One™ lift design is perfect for lifting just about any vehicle within lift capacity. The Challenger Versymmetric Plus CL10V3 automotive lift provides open door clearance to driver controls for both asymmetric lifting applications and symmetric auto lift applications. Why Should you purchase a Challenger lift from ASEdeals? 1) Guaranteed Lowest Prices - Listen, we monitor our competition's prices. We know we usually have the lowest price on most of our equipment most of the time. Especially since we offer free shipping, while many others do not. In the unlikely event you find any of our automotive lifts advertised anywhere on the web for less, just tell us where you saw them, and we'll beat them. It's that simple. Our prices will not be beaten! 2) One of the Largest Challenger distributors -This means that you enjoy the benefit of our size. Not only does this allow us to offer the best pricing available, If you have any warranty issues that you feel are not being addressed quickly enough, or to your satisfaction, we have the influence with the manufacturer to get your issue resolved right away. 3) Years of Experience - So many internet companies have popped up over the past few years, claiming to have all kinds of experience, and then when you dig a little deeper, you'll find out that they've only been around for a few years.  We've been carrying auto shop equipment for over 20 years now. When you call and speak to us, you're not getting just an order taker that knows nothing about the product. We know these products better than most. Not only will get you answers to your questions, we will make sure that you get the proper lift for your application. 4) Reputation - Right along with the years of experience comes our reputation. Check out our reputation on all of the various car enthusiast forums out there, such as Garage Journal or Corvette Forum. You'll find countless satisfied customers, praising not only our prices, but also our integrity, honesty and ability to help you choose the right product for your application. And then, there's our hundreds of satisfied customer pictures and testimonials to back it up. We'll gladly put our reputation up against anybody's. You can view those testimonials here - https://www.asedeals.com/testimonials/ The only way you get this kind of feedback from customers is because they have been dealing with us for 20 years, and know that they can trust us to treat the customer right, and that we know what we’re doing. You can also take a look at customer reviews at - https://www.shopperapproved.com/reviews/asedeals.com/ You’ll see we are a 5 star rated merchant with over 500 customer reviews. That is the highest rating you can get. These are reviews obtained from Shopper Approved. They are an independent 3rd party company, so we have no way of influencing these reviews in any way. We'll put our reputation up against anybody's.